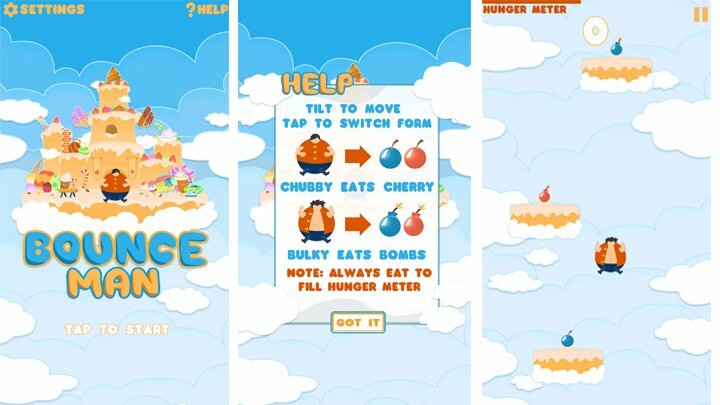 Tap and tilt to help Bounce man eat everything in his way! Bounce man needs to eat every five seconds so hurry up! Stay focused he eats bombs when he is in buffed mode and eats cherries when in normal mode. That's a nice little game! One thing I noticed is that when there's a bomb on the second island, I get hungry and lose while waiting for the 3rd island to appear (or am I missing something?). And also, it's a bit annoying that you have to click 3 times to play again. I think, it would be move convenient if you could find a way to shorten it to just one click. Overall, it's fun to play. THANK YOU SO MUCH! for trying my game :) . I think you have missed the hunger meter which gives you 5 secs till bounce man gets hungry! And for the 3 time clicking it's because you have not cleared more than 10 points which most likely means you have not grasped the instruction that is why it automatically redirects you to the help page. A nice time killer, but sounds are too rough in my opinion and some music would be nice to hear, because this constant jumping sound is getting annoying too fast. I've reached 18 points and I think that the level has to be more diverse (more platform types, obstacles, enemies, bakgrounds etc) as it becomes tedious to see all the same things, but may be I've just played not enough. And, perhaps, you should start to move the screen down only after player get aquainted with the controls (give some time to try tilting and tapping till player will be comfortable and only then drop him down. Now you can loose in a second after you start the game because you miss the first platform, it's kinda too fast IMHO). In general, I think it's a nice concept but needs some further work. HELLO! Thank you for taking time trying my game! :) It feels like there would be so much sounds working on with the bouncing plus background music. But I'd give that a shot and i'd also try to fix the sound effects since i did some clipping for all sounds to be normalized at a certain db. Thank you for that! For the difficulty i think it would really be a pretty harsh game as it goes faster really. Try giving it a longer try sometime! :). Actually pressure increases and confusion increase as you play it longer but depending on how things work out i might go for your suggestion in adding more obstacles! For your last suggestion i am not quite sure if i got that right. Are you suggesting for me to add a demo run instead of flashing mechanics of the game? Nonetheless, thank you once again! Thank you so much for that! i'd be going to apply that suggestion as soon as possible :) if you dont mind i would like you to roast this game too! It is a simpler one but please let me hear your thoughts about it! Thank you so much for your feedback! do you mean the settings menu? or the home menu where bounce man is? i would be adding more assets for different dpi soon! 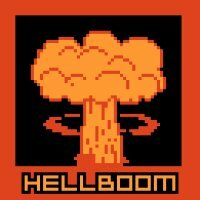 by the way i would like to invite you to roast my new game here!